Digital Disney World: DDW Pic 1936. Christmas - Jingle Bell, Jingle BAM! DDW Pic 1936. Christmas - Jingle Bell, Jingle BAM! Christmas - Jingle Bell, Jingle BAM! Hollywood Studios debuted a new Christmas show this year called "Jingle Bell, Jingle BAM!" 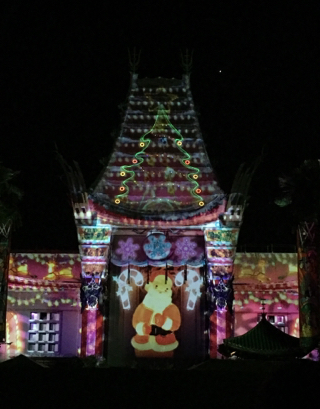 It is an amazing production that features video projected onto the Chinese Theater, fireworks, lasers, and even snow. I snapped this shot during a scene that features both Santa and a Christmas tree.